The staff at Sky Transport Solutions (STS) and IFTAreportFiling.com can easily complete your California ARB (CARB) CARB registration process. What types of vehicles are subject to this regulation? The regulation applies to all on-road class-7* and class 8 (GVWR > 26,000 lbs) diesel-fueled vehicles that visit California’s ports and intermodal rail yards regardless of the state or country of origin or visit frequency. The regulation does not apply to certain types of vehicles including emergency vehicles, military tactical support vehicles and dedicated use vehicles. *During the December 2010 Board hearing, the Board approved the expansion of the regulation’s applicability to include class-7 trucks (GVWR 26,001 to 33,000 lbs) and drayage trucks operating off of port or intermodal rail yard properties. These changes will become effective pending Office of Administrative Law approval. Who must comply with the regulation? The regulation establishes requirements for drayage truck drivers, drayage truck owners, motor carriers that dispatch drayage trucks, port and marine terminals, intermodal rail yards, and port and rail authorities. In general, the regulation requires emission reductions from drayage trucks as well as recordkeeping and reporting to help monitor compliance and enforcement efforts. The basic responsibilities for each stakeholder are as follows: truck drivers must provide motor carrier contact information, load destination, and origin to enforcement officers, if requested; truck owners are required to register their trucks in the State administered Drayage Truck Registry (DTR), ensure their trucks meet emission standards by the appropriate deadline dates (see table below), and ensure that emission control technologies are functioning properly; motor carriers must ensure that dispatched trucks are compliant with the regulation, provide a copy of the regulation to truck owners, and keep dispatch records for fi ve years; and terminals are required to collect information from each noncompliant truck entering their facility and report it to their respective port or rail authority, who then reports this information to the ARB. 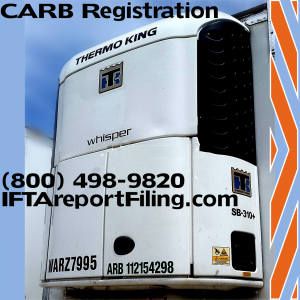 Call (800) 498-9820 for fast service with the CARB registration process.